What did my candle smell like? Mmm! Great description. First impression… this candle smelled fruity and exotic. The notes I picked up on the most was lime with an added spicy element I couldn’t quite pinpoint. I don’t know what “lycee” is so I did an internet search and the only thing that came up was a French school so I’m wondering if that word was misspelled in the description and it was supposed to by lychee?…. Good a guess as any. The overall scent though was incredible!! It was all lime but had a masculine vibe to it… I liked it a lot. I lit this candle in a small bathroom to start out and ended up leaving it there from start to finish. The scent in a small room…. AMAZING and so strong!! I could have easily moved this candle to a medium sized room and it would have performed just as well but left it where it was for maximum scent throw. The main reason… that bathroom is close to where I spend most of my time so I was able to enjoy the aroma all day long and oh my goodness did I love it!! 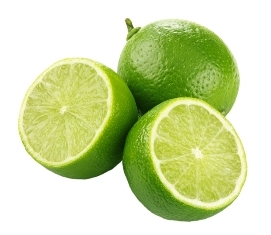 Imagine zesty and sweet lime with an added masculine spice blended in. That’s what this fragrance smelled like to me. It was masculine, fresh and beyond yummy. I can totally imagine this fragrance in bath and body or my husband wearing it as an aftershave or cologne. I liked it that much. Strength – on a scale of 1 to 10, I would rate this candle a 6 in a large room. 8 in a medium sized room and 10 in a small room. Loved the strength!! The aroma from this candle filled my bathroom with fragrance and spilled out into my living room. Loved loved loved!! How did my candle burn? I think this is by far my absolute favorite scent so from Bluewick. It was the most unique citrus scent I’ve tried from any company to date. It was fresh, citrusy but exotic all wrapped up into one fragrance. And the strength – perfect!! This candle held its own from start to finish and I’m all around super impressed. Highly recommend this candle if you can get your hands on one. Bluewick unfortunately is now out of business. We will keep our reviews active on this brand for reference only. 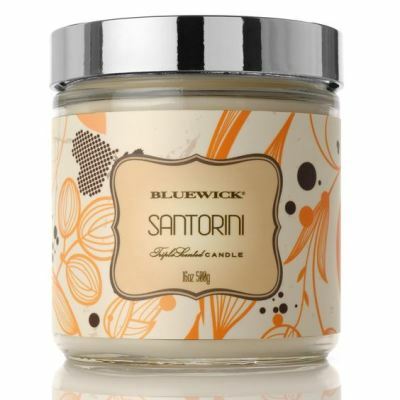 Scent description for Santorini - This popular, tropical Greek island is well known for its seclusion and beauty. We've combined the best fruits found there in this awesome tribute of soft plum gently blended with lime and a touch of lycee. This candle is spectacular but sad you can't purchase it anymore. It was one of my favorites from Bluewick. This brand has some amazing fragrances. Some burn better than others. It's pretty hit and miss with how each candle burns which is not good but, they do have pretty great sales so it's worth it for me. Definitely recommend.